My friend Terry and I have traveled to Ireland six times in the past ten years. Most of our trips went off without a hitch but there were a few really bad experiences. I think the most important tip is to book a direct flight. The two times that we had connecting flights we ran into a lot of problems. Sometimes the layovers can be too long or too short and the connecting flights are at different terminals. The first time, we had booked an inexpensive connecting flight on American Airlines. After waiting in the terminal for our delayed flight, and worrying about missing our connection, the flight was cancelled. Then everyone in the terminal was scurrying around trying to make other arrangements. We happened to get lucky and were booked on a direct flight to Dublin via Aer Lingus. We prefer to fly Aer Lingus but were trying to save some money. When we arrived at Dublin Airport, we had no luggage. American had not transferred our luggage to our new flight. We went to the Aer Lingus information desk and they agreed to have our luggage sent to Co. Leitrim by courier as soon as it arrived in Dublin. This was on a Monday morning ... our luggage never reached us until late Thursday afternoon. We were not very happy, and I wrote to American, but they never responded. Our flight back to the States was with our original boarding passes. We flew BMI to London Heathrow for a connecting flight via American to Boston. The layover was too short a time span, and it seemed that we walked for miles, at a very fast pace, trying to get to our departure terminal. We went up stairs and down stairs and through the duty free shops and the food court. We were both exhausted by the time we boarded the plane. It was horrible, and we vowed to never do that again. The second time, we had booked a flight with Aer Lingus. We arrived early at Logan Airport in Boston and, upon checking in at the Aer Lingus desk, we were offered an earlier departure via (we thought) Aer Lingus. Well, it turned out to be Omni International, who was backing up Aer Lingus for the St. Patrick's Day overflow. Well, needless to say, the flight actually left Boston later than the original flight did. We decided not to do that again. The third time, we had booked a flight via Aer Lingus but with a layover in Newark. 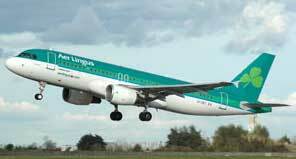 We trusted Aer Lingus, and we never thought we would have a problem. So, we got to Newark and, lo and behold, we had to change terminals and recheck our luggage. This was during our last trip, which was in the summertime. It was so hot and humid we felt like were going to faint. Well, we finally arrived in Dublin and had a wonderful two-week stay in Ireland. Aer LingusThe flight home was a different story. The entire trip home was terrible. The flights were delayed out of Dublin because the planes coming in from the US were late due to torrential rain on the east coast. These flights would go from Ireland and back to the US several times a day. We finally got off the ground but we were late and would miss our connecting flight in Newark. When we were approaching Newark, the captain announced that we were going to be in a flight pattern over Newark for about an hour. They were not letting any incoming flights land because of the rain accompanied by thunder and lightening. Aha! They let us land during a brief lull in the storm. Thank goodness! Because we arrived in Newark late, we had another terrible time finding a flight to Boston. We had to take a very scary ride on an el to another terminal. Then, up the stairs, down the stairs, and a lot of walking. Again, it was so hot and humid we could barely stand it. At midnight, we took off out of Newark and arrived in Boston in the middle of the night. We had a great plan in place that we had used on every trip. We would take a bus to Logan so we didn't have to pay huge parking fees for leaving our car there for two weeks, not to mention the congestion from 'the big dig'. We had just missed the last bus out of Logan and the next one was at 8:30 AM. Oh, brother! So, Terry and I took turns sleeping in the terminal until morning. By the time this trip was over, we were never so happy to get home. My advice on booking your airfare to Ireland is to get a round trip direct flight to Dublin via Aer Lingus. They usually touch down at Shannon to let people off and on which only takes about a half hour. Not only do we feel that Aer Lingus flights are the best but the plane ride is comfortable. The seats are not crowded together like on some other airlines, and the Irish flight attendants are delightful. I highly recommend flying Aer Lingus!